Whitson CM is proud to offer a variety environmental and stormwater compliance, and construction management services. Whitson CM manages all the aspects of the NPDES Construction General Permit for construction sites throughout Southern and Central California. Our entire staff is certified by the State of California including a Trainer of Record, our staff comprises of a wide variety of professional backgrounds including construction managers, professional engineers, environmental managers, industrial specialists, and individuals that worked for the State Water Resources Control Board. We write Stormwater Pollution Prevention Programs (SWPPPs), Water Pollution Control Plans (WPCPs), Stormwater Management Plans for all municipalities including Caltrans’ templates. Our certified staff manage projects for Legally Responsible Persons (LRPs), contractors, utility providers, developers, military contractors, municipalities, universities, school districts, tribes, and many others. Our customers find value in our services and trust our recommendations. We also have extensive experience mitigating violations for projects in which Whitson CM did not manage prior to the violation being issued. Never has a Whitson CM project been found in non-compliance or have had a violation issued. Whitson CM manages a variety of industrial sites throughout California. WCM develops Stormwater Pollution Prevention Programs (SWPPPs), site specific stormwater management plans, training programs, and spill prevention and management plans. 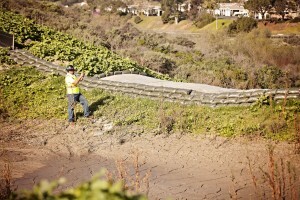 In addition, WCM performs project audits, site inspections, rain event inspections, and stormwater sampling/analysis. Whitson CM will perform everything an industrial property manager or owner needs to guarantee compliance with applicable permits. Recently, the State adopted a new Industrial General Permit. This permit will dramatically change how businesses and properties manage stormwater compliance. Whitson CM has extensive experience implementing new permits and has begun the transition with all of our existing customers. Please let us help you navigate this new permit and assist you with its implementation. Whitson CM acts as an owner’s designated representative on engineering construction projects. Whitson CM manages the design and permit process, writes all project bid documents, writes all contract documents including consultant agreements, manages the construction process, writes all contract change orders, manages SWPPP, manages the design engineers, city and or Caltrans, geotechnical engineer, surveyors, biologists, paleontologists, archeologists, and applicable utilities, closes out the project, assures city and/or Caltrans acceptance of the project and obtains bond releases. Whitson CM is a licensed engineering general contractor with over 25-years of experience constructing heavy civil projects. Our extensive experience in all facets of site construction provides our staff to anticipate potential issues and to take a very proactive approach to managing a project. Much like our construction management projects, we mitigate the risk of large developments all minimizing the financial risk to our customers.